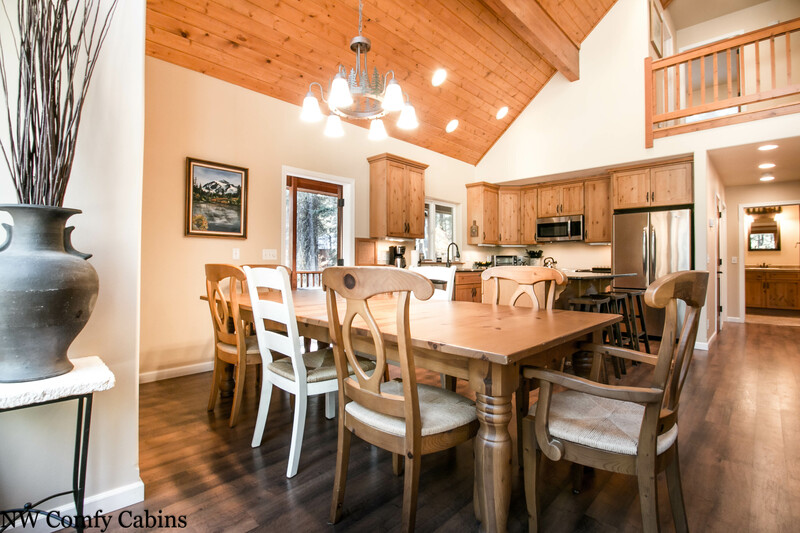 Distinctive and cozy mountain home comfort surrounded by the fresh smell of white pine and the sounds of nature, in a quiet mountain community. 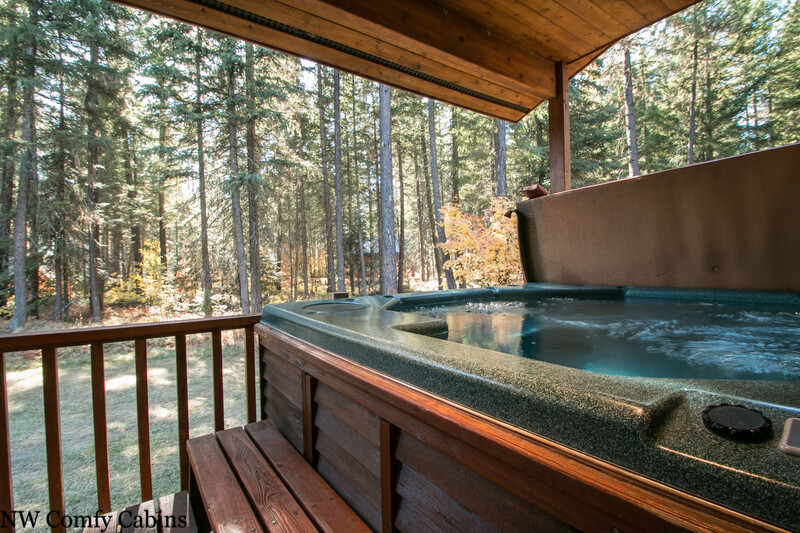 Relax and melt away whatever stress you brought along with you in your own private hot tub while being serenaded by the birds and chipmunks. Keep your eyes peeled for a visit from the White Tail or Mule Deer that call this area home. You might be asking yourself ‘when can we come back’ even before you unpack your trunk. Take a deep breath and slow down...it will all be there when you get home, so enjoy your time at ‘Getaway Moose’....your home away from home. Gorgeous high celings with pine accents, a river rock fireplace and large picture windows showcase the outdoors as you enter this beautiful home. Fully functional kitchen including d/w and breakfast bar with stools. A main floor bedroom with king bed attaches to the main floor bathroom with Jack/Jill sinks and a shower. 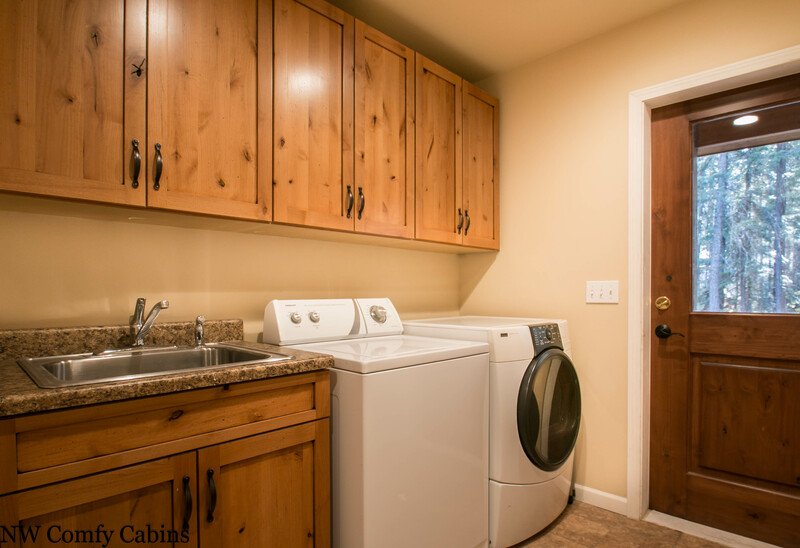 There is also a washer/dryer for guests use. Upstairs you will find a full bathroom with shower/tub and 2 more bedrooms; 1 with a queen bed, and the other with a beautiful set of bunk bunds offering sleeping for 4 children. The Getaway Moose is located in a community that is snowmobile trail accessible and has ample parking for your trucks/trailers. We know that no matter what your visit to the area entails, the Getaway Moose will most certainly make your stay comfortable and memorable. PLEASE NOTE: this is a privately owned vacation home and we recognize that the home may sleep more than 8 people. 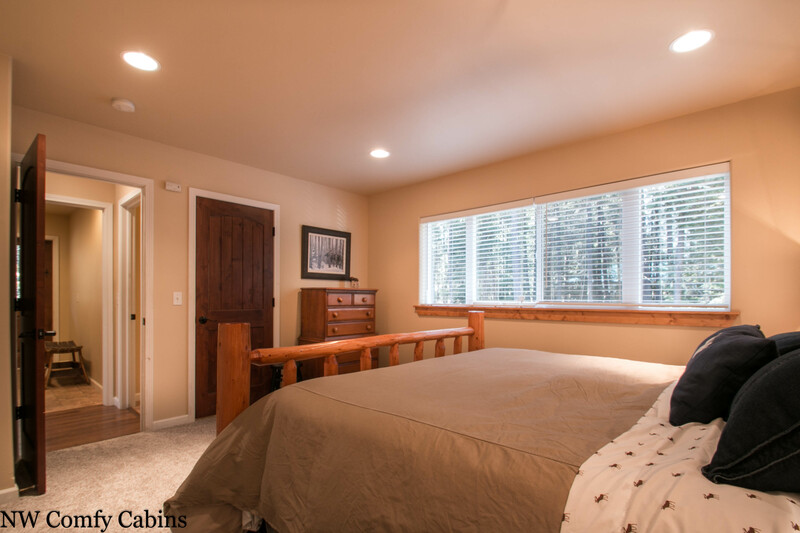 The owners (based on fire marshal regulations, Chelan County rental regulations and out of respect to the communities we live and work in) allow a maximum of 8 guests under the rental contract. There are never to be more than 8 guests staying at the property during any rental contracted period of time. If more than the contracted number of guests are found on the property the contract will be null and void and guests will be required to vacate with no refund. Please understand and note that we are legally bound to adhere to our contracts with out owners and regulations. We respect and appreciate the efforts that allow us to offer vacation rentals for all to enjoy. Fees Vary By Season, Festival Dates and Holidays. The base rate for this property is for the first 4 guests. Any additional guests over 4 will be calculated at a fee of $25.00 per guest per night up to the maximum occupancy of 8 people. Children 1 and under are FREE. This home is not pet friendly. Perfect property and location for our family get together. House was everything we wanted. Plenty of room, very homey and comfortable. Would go back again in a heartbeat!! Thank you for letting us know that you enjoyed your stay at the Getaway Moose. It is a very nice getaway for sure and we are pleased that your time was enjoyed. WONDERFUL ~ We spent 3 nights here enjoying all that is Leavenworth. The cabin is AMAZING, fully stocked with everything you could need, beds were comfy, hot tub right on the deck was nice as well as tub towels waiting for you, all sorts of movie channels to pick from and fireplace was a perfect touch. We were packed in with snow but the yard looked big from the large beautiful A frame windows. That is so nice to hear, and we thank you for sharing your experience with us. The cabin is quite beautiful and is certainly one that people seem to enjoy considerably. It is a lovely place with a great neighborhood and a fabulous place to share memories with family and friends. We hope to have you back again. This is a beautiful home. We had a group of 10 women for an annual get together and there was enough room that we didn't feel cramped. This home is a good drive outside of town. Even with directions from the rental company it was a bit hard to find. After a few U-turns we got there. I would not say this home sleeps 10. One of the beds is a futon, a very nice futon, super soft and comfy but more suited to one person than 2. 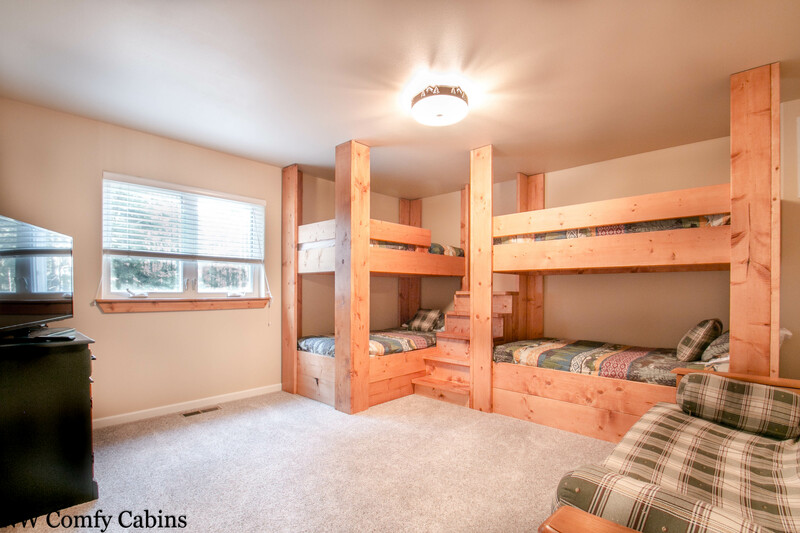 One of the rooms has 4 bunk beds and we found that to be a fun feature! The water heater is not up to dealing with 10 people showering. We had a number of cold showers. The hot tub was only set to 99 degrees and there is a note not to touch the controls. The fire pit was "under construction" and not legal for use. It's a beautiful home and we had a great time but it could use some attention to make it a truly carefree stay. Overall we enjoyed our stay and would still recommend this home. House was wonderful, clean, well equipped, but front door wouldn't close, the hot tub didn't work, and the construction of a massive garage next to the house ruined the ambient feel of the chalet. The fires in the state park meant we couldn't open the windows, and had to listen to the sprinklers running 24/7. So sorry that the fires affected your stay. The home owner is in fact building an amazing shop on their property, but the area has been fenced and the yard is very large and away from the area that this is being built. The hot tub has not had any issues and is functioning, so I am not sure what problems you were experiencing unless it was still heating from being cleaned before your arrival, but the tub is working and no problems exist that we can see. The sprinklers should not have been going all the time and are at the front of the cabin not near any bedrooms. I am just very sorry that your experience was not a good one and I am a bit confused by these issues and will look into them in detail to see if there is anything we might be able to do to make it better. 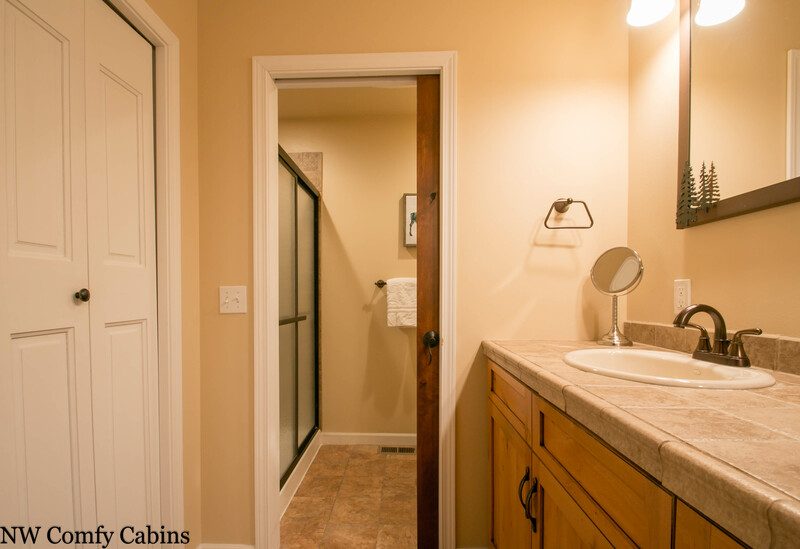 This home is a very beautiful cabin and has been greatly enjoyed by our many guests and that is what we seek to experience with all of our guests. We do offer a return guest discount and I hope that you will consider staying at another Comfy Cabins property to take advantage of the discount and allow us to show you a 'comfy' experience at a time when there are no fires creating a smoky atmosphere. The cabin had everything we needed. Literally only needed to bring our clothes! Peaceful, clean, and relaxing!! Everything was perfect. Our family needed a getaway and this did the trick. Everything from the beds to the hot tub was perfect. Everything was as advertised and everything was really clean. We will be going back. 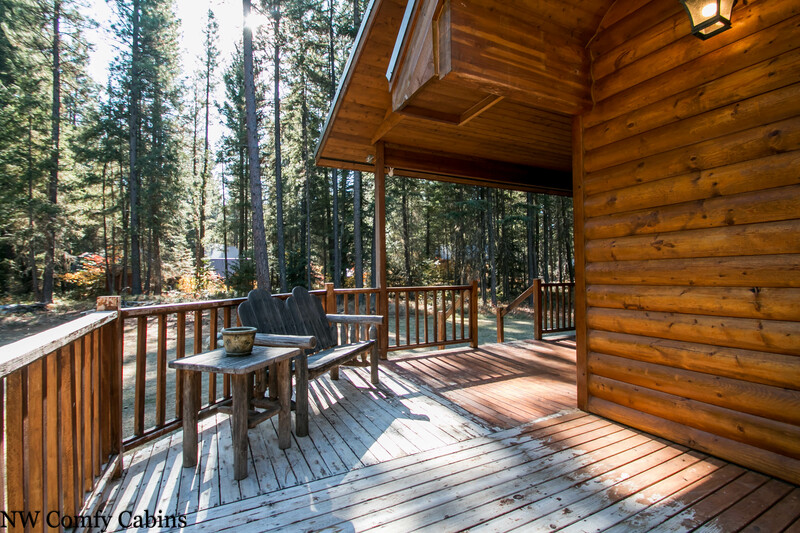 This cabin was the perfect getaway! We enjoyed being just a short distance from Leavenworth, but also feeling that we were away from it all in this picturesque location. We were so lucky to have so falling our entire time there with plenty for the kids to play in! The house is incredibly maintained and was a great spot for our 2 families to stay. The hot tub was not serviced before our arrival. The electronic door lock was confusing and no directions were provided. The grill was not working and outdoor seating was minimal. A new home was being built within feet of the Getaway Moose and this should be disclosed to renters. Manager response on 2018-06-28 - Response from NW Comfy Cabins Inc.
Nice place. I'll likely go back if available when needed. It was a great place for my friends and family to just settle in and make meals and talk and listen to music. This was a wonderful cabin! My family and I really enjoyed our stay. The cabin was so comfy. I would love to take my family out there again. Very charming cabin that was easy to find! House was well maintained. We noticed a couple minor things that we conveyed to the management and everything was fine! Manager response on 2017-12-31 - Response from NW Comfy Cabins Inc.